On a cold day, I feel like making local dishes of the Northern Japan where there are lots of wisdom to survive the freezing winter. So I made Damako-nabe, a Japanese hot pot with small rice balls which is originated in Akita where it snows a lot in winter. 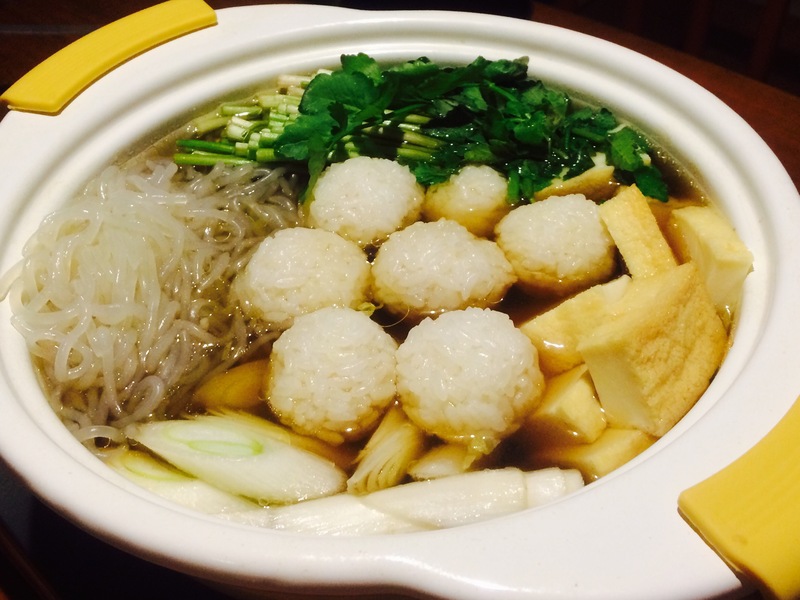 Make small rice balls – mash cooked rice and make small rice balls. It gets easy if you soak your hands in salt water each time you make a ball. Slice burdock root and cut other ingredients in bite size pieces. Add water, burdock root and chicken in a pot and cook. Flavor with soy sauce, sake and mirin, as you like. Add other ingredients and eat when it’s cooked. I’ve never heard of damako-nabe before! I’m heading up to Aomori tomorrow morning, and I have no idea what to expect. Is it absolutely freezing up where you are? Welcome to my blog, Elle! Currently I live in Saitama (just north to Tokyo), but I used to live in Aomori for two years. It must be much colder than the eastern Japan, but Aomori has lots of beautiful scenaries and great food. Famous winter dishes there include “keno-jiru (soup with a variety of vegetgables)”, “jappa-jiru (miso soup with the head, bony parts, guts of codfish and vegitables)” and “kaiyaki(or kayaki)-miso (scallop and eggs cooked on a large scallop shell with miso broth)”. If you go to the southern part of Aomori, you can enjoy “senbei-jiru (soup with cracker made from wheat flour, vegetables and chicken)” and “hittsumi (soup with flour dough and vegetables)”… It’s fun to visit the local markets there too. They also have great hot springs, especially around Mt. Hakkoda, ice-covered trees called “Monsters”, nice museums, spritual Mt. Osore in Shimokita peninsula… and their unique dialect…Oh, I miss Aomori!! Oh wow, it sounds like there is so much great stuff to do there! I’m only going to be in Aomori for one night, accompanying someone on a business trip. I’m staying in Tokaimura now, so it will be a long eight hour drive up there, starting very early tomorrow morning. Oh, driving from Tokaimura…that’s a long way…take care and have a safe trip! !